Bamboo is a truly remarkable green building material. It’s twice as strong as concrete and slightly stronger than steel. It’s also a renewable resource that needs little energy to grow, prevents soil erosion, provides biomass, offers wildlife refuge, and produces a healthy food supply for both wildlife and humans. Offering significant remediation from the effects of climate change, bamboo produces more oxygen than other plants, and captures higher amounts of CO2. The first harvest can be taken in three to five years, significantly faster than wood forests which typically need 25 years. Harvested properly, ten percent of every plant can be taken annually without needing new plants or negatively impacting the original grove. Tree wood is a one-off building resource needing another 25 years to replace each tree. But one bamboo plant can produce nearly 33,000 feet (10,000 meters) of material in 20 years–at least 12 times more material than normal wood! As a sustainable green building material, bamboo provides shelter, transportation, and a huge variety of useful commercial products for eco-friendly daily living. 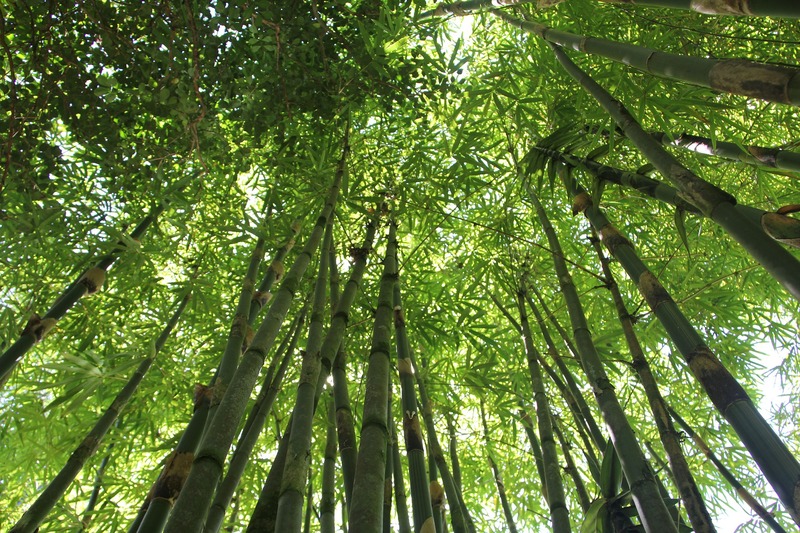 The largest plant in the grass family, there are more than 1,600 species of bamboo. It is a native plant on all continents except Antarctica and Europe. Native Southeast Asian species account for 64 percent, while 33 percent of species are in Latin America. The rest are in Africa and Australia/Oceania. Only three species are native to North America. You can actually watch bamboo grow. The stalks, called “culms,” can grow up to 0.039 inches (1 millimeter) per minute, and up to 47 inches (1.2 meters) per day, depending on the species. Some never grow more than about 7 inches tall and 0.07 inches in diameter, while others stretch to nine inches in diameter and 130 feet (39.6 meters) tall! Although it might seem like a light-weight construction material in comparison to concrete or steel, looks are very deceiving. Research shows the tensile strength of bamboo is 28,000 pounds per square inch versus 23,000 pounds per square inch for steel. This superior strength comes from the fibers which make up the inner and outer “skin.” With a high silica content, the skin is waterproof, protecting the inner wood from weather and insects. Also, the hardness of the inner wood under the skin is similar to oak. 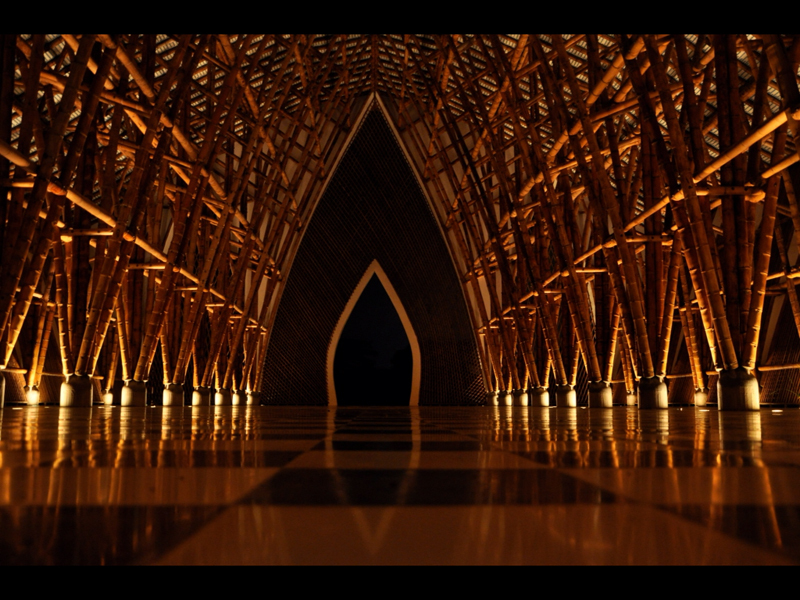 In structure, bamboo is like a tube with reinforced joints or segments. This natural tubular design results in lighter weight over longer lengths and protects against bending and breaking much better than a steel rod. Also unlike steel, bamboo is not a heat conductor. It is a great insulator, providing natural cooling and energy efficiency in a building. For purposes of architecture and construction, age and species are critical. Guadua is the most popular species for building in the Americas, but every country has its own preferences. Age factors, on the other hand, are fairly standard. Insects all over the world are attracted to the high starch content in young culms, and also attack older plants. Even harvested at the optimal age for strength and stability, bamboo should always be properly cured and treated for use in structures of a more permanent nature. Among the earliest recorded uses, the Chinese filled bamboo arrows with gunpowder to make them travel further. These “fire arrows” eventually evolved into firecrackers and rockets. Thomas Edison made the first light bulb filaments from carbonized bamboo. In early construction projects, the ancient Chinese invented suspensions bridges by using the exterior, fibrous “skin” of bamboo to create tension cables from which the walking surface was hung. This same technique was used by the ancient Incas in South America, and in India, as well. The Chinese also used bamboo regularly in their airplanes during World War II. 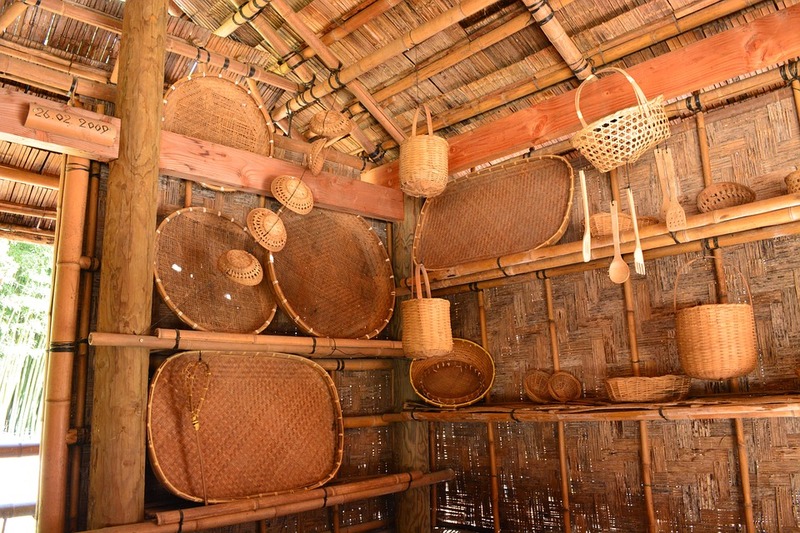 Still today, buildings of bamboo are widely popular all across Asia, parts of Africa, and South and Central America. Many award-winning architects are world-renowned for their stunningly creative projects. Two of these are Oscar Hidalgo Lopez, considered the “Godfather of Bamboo,” and Simón Vélez, both exceptional architects from Colombia, South America. The projects of Simón Vélez have included residences, a country club, an observation tower, and horse stables. Vélez was the first to use multi-culm beams and often uses massive cantilevers, some as large as 37 feet. Slowly gaining appreciation in the US, bamboo has been certified by the ICC Evaluation Service (ICC-ES) as a legitimate structural element. And, just because I couldn’t choose which video was better, here’s another great one — This is from Building Trust International‘s 2016 Design-Build Workshop in Kandal Province, Cambodia. This is a community library and pre-school being built during a recent training workshop held by volunteers from Building Trust International and Aide et Action. – Don’t forget – Watch for new posts every week in our new series, The ABCs of Green Building Materials. And if you’d like to give a shout out for a project highlighting great green building materials, please add a comment below!